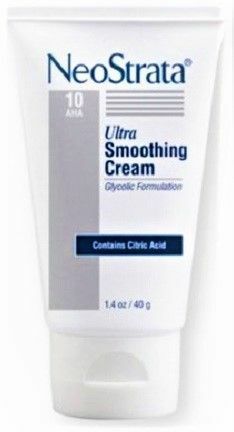 Home/NeoStrata/NeoStrata Ultra Smoothing Cream 1.4 fl oz. Ideal for new users of Glycolic Acid, this antioxidant exfoliating cream moisturizes and restores a visibly smoother appearance to skin. Clinically proven to significantly improve firmness, mottled pigmentation and overall clarity when used with NeoStrata Ultra Daytime Smoothing Cream. 86% noted improved skin smoothness and rejuvenation after four weeks of twice daily use. Treats scarring, skin discoloration and signs of aging, like fine lines and wrinkles; An exfoliator that removes the outermost layer of dead cells from the complexion, revealing brighter and fresher skin. Encourages cell renewal and fade signs of aging; Treats uneven skin tone; Increases the production of collagen; Unclogs clogged pores. Repairs and rejuvenates skin; Acts as a natural moisturizing agent beneath the skin from the inside out; Functions as an antioxidant to help naturally build collagen production. Apply to the face and neck once daily for two weeks and twice daily thereafter, as tolerated. Gently smooth in the cream until it disappears. Daily use of sunscreen or sun avoidance is recommended. Water, Glycolic Acid, Caprylic/Capric Triglyceride, Glyceryl Stearate/PEG-100 Stearate, Stearic Acid, Isopropyl Palmitate, Propylene Glycol, Cetyl Alcohol, Dimethicone, Ammonium Hydroxide, Isostearic Acid, Cholesterol, Sorbitan Stearate, Phenoxyethanol, Stearamidopropyl Dimethylamine, Magnesium Aluminum Silicate, Hydroxyethylcellulose, Tetrasodium EDTA, BHT.